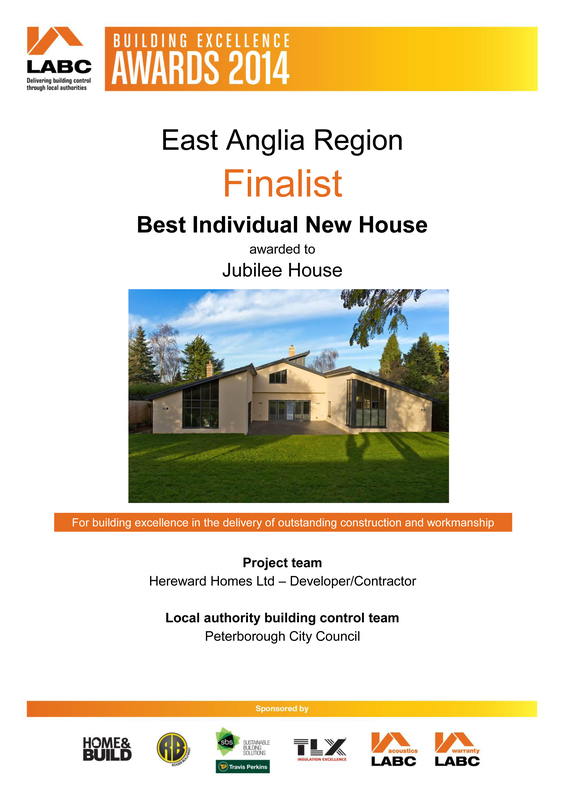 Finalist – East Anglia Region, Best Local Builder or Traditional Craftsmanship award for building excellence in the delivery of outstanding construction and workmanship. awarded to Jubilee House for building excellence in the delivery of outstanding construction and workmanship. The company was encouraged to enter the awards by the team at Peterborough City Council Local authority building control team who recognised the amount of effort put into the Jubilee House scheme and other recently completed developments on First and Second Drift Wothorpe, Peterborough Road Castor and other local developments. The LABC Building Excellence Awards span across England and Wales and are all about the essence of good buildings. The award finalists are not judged on architectural beauty, but on the “Excellence” shown from a construction and technical building control point of view. The awards celebrate not just the completed buildings but also acknowledge the amount of work that the design and construction teams have had to do to overcome technical issues, deal with difficult sites and find innovative and creative solutions to create high quality schemes. LABC are a not-for-profit, member organisation, representing all local authority building control teams in England and Wales. With over 3,000 members professional surveyors and building technicians working in local authority building control they provide a consistent national service that is delivered at a local level. The organisation ensures that new developments are built to be safe, warm and dry. They actively work to promote, support and enhance compliance with the building regulations and strive to improve standards in the building industry. To find out more about the awards click here.